The United Nation's General Assembly proclaimed 2015 as the International Year of Light and Light based Technologies as a global initiative to raise awareness of how optical technologies promote sustainable development and provide solutions to worldwide challenges in energy, education, agriculture, communications and health. The present article gives an insight in to the ideas and developments of Light in the light of various thoughts and philosophies in religion and various developments in modern science. The contributions of India and Indian scientists in the theory, developments and applications of Light and light based technologies in various branches of science are very commendable and admirable and are elucidated in the paper. 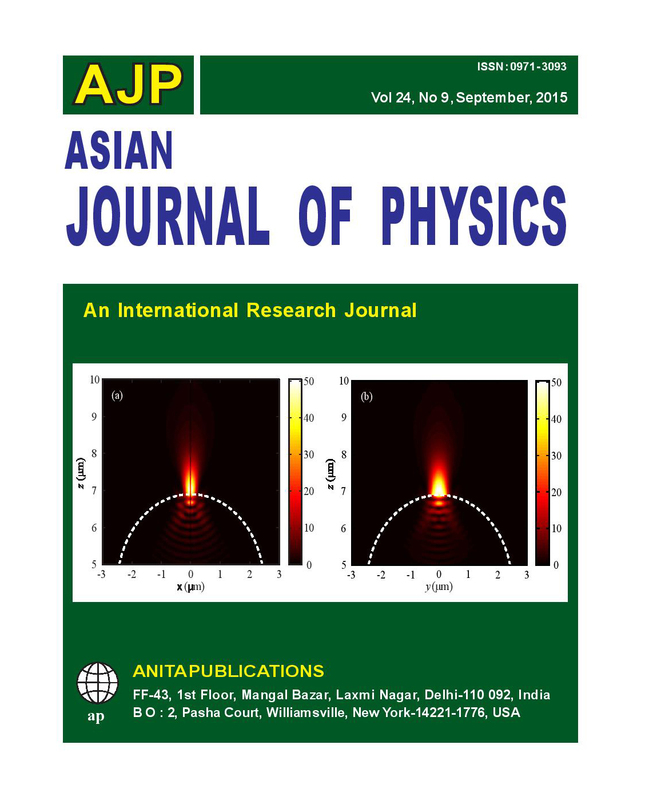 The article also describes the origin of masers and lasers and the latest developments in the practical realization of another state of matter viz Bose-Einstein Condensate which has originated from the deep thoughts of the Indian Scientist S N Bose and contributed by the German genius Albert Einstein. Protagonists of science believe that science only can save the human kind, and scientific knowledge can bring about improvements in human relations, but the recent Paris protocol of December 2015 signed by 195 countries in which India played a major role shows that international understanding is also inevitably necessary in order to make the progress in science and technology in a sustainable way for human development and for the final protection of the Mother Earth. © Anita Publications. All rights reserved. Key Words: International Year of Light, Light based Technologies, Bose-Einstein Condensate, Albert Einstein. We obtain explicit equations for the distance at which the Airy beam, limited in initial plane (from the side where amplitude drops slowly), propagates along the parabolic trajectory without changing its amplitude (i.e. almost diffraction-free). Analogical distance for diffraction-free Bessel beam is proportional to the radius of the circular diaphragm which limits the beam and inversely proportional to the tangent of the slope of the conical wave which generates the Bessel beam. This distance is wavelength-independent. For the Airy beam this distance is proportional to the square root of the coordinate of the diaphragm edge and inversely proportional to the wavelength of light. © Anita Publications. All rights reserved. In this paper, we write (2 + 1) -dimensional wave equation in non-standard form: the second time derivative is included under the convolution integral which describes the electric induction or polarization of the medium. We develop explicit finite-difference scheme for solving of this wave equation and compare solutions of the equation, taking into account dispersion and without taking dispersion into account. RMS between the solutions is 2.87%. We compare the solution of the wave equation with the solution of Maxwell’s equations by the (FD)2TD-method in the package Full WAVE. RMS between the solutions is 6.2501%. The detailed analysis of the obtained solutions for a femtosecond pulse with a sharp initial front shows the precursors, which come to the observation point before the main pulse. The intensity of the precursors is 100 times smaller than intensity of pulse. The calculated time delay of appearance for Sommerfeld and the Brillouin precursors differs from the theoretical time to 7%. © Anita Publications. All rights reserved. We have analytically and numerically shown that when a plane wave is diffracting by a three- and four-level spiral phase plate (SPP) with a triangular and square aperture, an optical vortex with the unitary topological charge is generated near the optical axis (in the center of the Fraunhofer diffraction pattern) in an area approximately equal to the Airy disk. Composite SPP consisting of 6 or 4 such triangular SPP can generate optical vortices with topological charge of 2 and 4. © Anita Publications. All rights reserved. New parameters is found for Sellmeyer's model. More accurate matching (rms deviation of 6%) of the model curves of refractive and absorption indexes and the cloud of experimental values of the dispersion curves for a silica glass in the range from 20 nm to 100 µm are obtained. Simulation of the propagation of ultrashort Gaussian pulse (duration of 3.35 fs) in a waveguide, whose permittivity is described by the common and refined Sellmeyer's models, by Full WAVE using FDTD-method showed a significant effect of dispersion on the pulse propagation. High absorption (10 times more) and delay (0.35μm) to 7 μm were observed in the case using refined Sellmeyer's model. The femtosecond pulse loses 90% of its energy at a distance of 7 μm in silica glass, whose permittivity is described by the refined model.. © Anita Publications. All rights reserved. The numerical analysis of the diffraction of Gaussian beams with the first-order phase singularity on cylinder with a subwavelength radius, diffractive axicon and binary relief at the end of the optical fiber was studied. The effect of different characteristics on the diffraction pattern in the near field is investigated: type of polarization of laser light, changes the refractive index of the material, resizing of the element. It is shown numerically that the longitudinal component of the electric field can be focused near the surface of the element into a light spot with the size of 0,27λ at half intensity (light spot size with all components is 0, 39λ). © Anita Publications. All rights reserved. a Image Processing Systems Institute of the Russian Academy of Sciences, Samara City, Russia. b S.P. KorolyovSamaraStateAerospaceUniversity (NationalResearch University),Samara City,Russia. We have considered the possibility of using zero order axicon in imaging hyperspectrometer. We carried out a simulation of hyperspectrometer in geometrical and wave optics. © Anita Publications. All rights reserved. Keywords: imaging hyperspectrometer, axicon, Radon-image. We propose a generalization of spherical waves in a form of linearly polarized beams with embedded optical vortices. These vectorial beams are obtained based on scalar Hankel beams discovered by the authors recently. We have derived explicit relations for complex amplitudes of all six components of the proposed beams. These expressions allow obtaining analytical expressions for the Poynting vector and the angular momentum. Distribution of the total intensity of the proposed generalized spherical wave does not have radial symmetry. © Anita Publications. All rights reserved. We investigated a focusing of pulse and continuous wave by a dielectric microsphere with diameter varying from 0.5 μm to 5 μm. Using FDTD numerical simulation it was shown that it is possible to obtain focal spots with diameters smaller than the diffraction limit. Simulation with Full WAVE have shown that the focal spot diameter produced by a microsphere with diameter of 5 μm equals to FWHM = (0.55 ± 0.08)λ for the continuous wave and FWHM = 0.54λ for the pulse with duration of 1.25 fs. Numerical results obtained using Full WAVE are in good agreement with results obtained using MEEP (FWHM = 0.60λ) and with results obtained experimentally using scanning near-field optical microscopy (FWHM = 0.60λ). © Anita Publications. All rights reserved. The influence of polarization to focusing properties was experimentally investigated using binary reflective Fresnel microlens illuminated by linearly-polarized light. The lens has diameter of 200 μm, the last zone width of 268 nm, it was manufactured by membrane technology, and is used to focus X-ray. It is shown that the reflected light contains the component with polarization perpendicular to the incident light polarization. It results in redistribution of energy between focal points on the optical axis. Different wavelengths have different polarization structure of reflected light, therefore focal points of different orders are obtained at different distances from the lens: focal points of zeroth and fifth order were obtained for wavelength 405 nm (f = 330 μm, f5 = 30 μm), focal points of zeroth and third order were obtained for wavelength 445 nm (f = 250 μm, f3 = 40 μm), and focal point of zeroth order was obtained for wavelength 633 nm (f =105 μm). © Anita Publications. All rights reserved.